The Tayeka cold brew maker is inexpensive, easy to use, and makes DELICIOUS coffee. Iced coffee is delicious and a year-round delight. But buying cold brew after cold brew gets expensive, and making hot coffee and then putting it over ice 1. Doesn’t taste as good 2. Takes too long to get your morning caffeine fix. Luckily, cold brew lovers, we have a solution — an inexpensive, foolproof, and low-key stylish solution: the Tayeka cold brew maker ($18.99+ on Amazon). I know it’s great, because I have it myself! 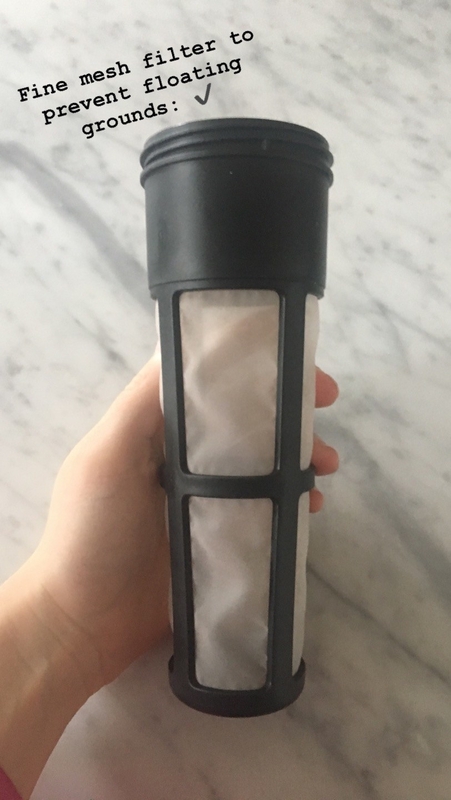 Pour 14-16 tablespoons of your favorite ground beans* into the fine mesh filter, and screw said filter into the lid of the pitcher. *Coarse or French Press-ground beans are suggested but TBH, I just use regular beans, and I don't have issues with grounds making their way into my coffee! Pour 32 ounces of water into the pitcher (you can measure, which I do, or eyeball it to around 3/4 of the way full). Drop the filter into the pitcher, screwing the lid on tight. Stick that baby in the fridge to brew overnight (or up to 36 hours). And wake up to a whole PITCHERFUL of goodness!! Just unscrew the lid a quarter turn to open it enough to pour! It's pretty concentrated, so you can either dilute it with water or milk, or just drink it straight with ice (I've done all three). It's so delish, it makes mornings far more bearable. DID I MENTION IT'S DISHWASHER SAFE?!?! And I’m not the only one who loves this by any means. We’re talking almost 1,500 hyped-up amazon reviewers who gave this bb five stars. 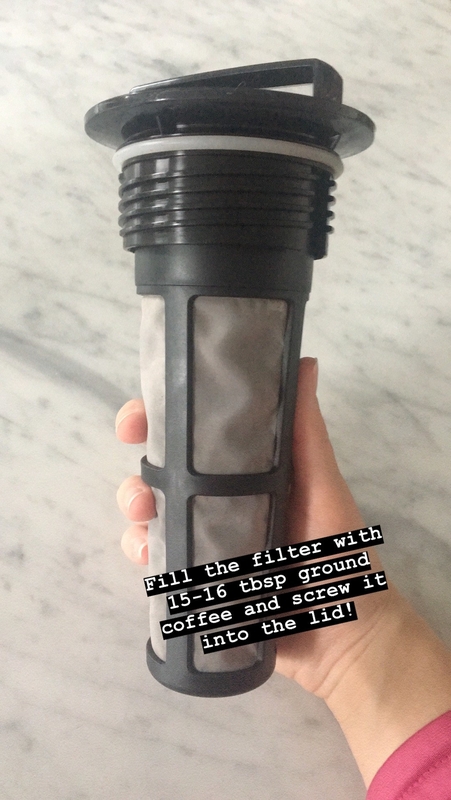 It’s also great for keeping in the office when that 3pm slump hits, but you don’t feel like going to a coffee shop (or spending $5 on cold brew). Get it from Amazon for $18.99 (for the one-quart size) or $34.99 (for the two-quart size). I have the one-quart version, FYI! Who else is craving a cup right now?